Just finished watching season 1 and 2. hopefully there will be a number 3. One thing about this anime which got me hooked to start with was its unique art style. The story is amazing but i have to admit at first i was a little confused. but the more you watch the more you begin to understand it. 9/10 The creators are genius in my opinion. One of The Best of the Season! Dont skip out on this mini-series/anime. Better than nearly all the drivel coming out the doors right now and at only 8 minutes a pop, thats saying something. Kagewani has a unique art-style, is action and story packed, has characters you care about, and has a satisfying ending. What more do you need in an anime? Although the plot is still interesting, and the pace is still good, compared to season 1, it is just not as intense, and most of the designs of monsters are not as fresh, either. The poor animation, which created great effects in season 1, does not have as intriguing effects any more given less image detail in the scenes. With more complex human interactions, however, the show is still quite enjoyable. Compact but not overwhelming details throughout the season, continual tensions and emotions, careful and uncliched settings accompanying unexpected but reasonable twists in plots, photo angle and scene cut techniques, appropriate ambient music, successful round character building within short time, etc. make this low-cost looking anime an exciting one. The low-cost arts might not even be bad but instead create unique styles that enhance the disharmony for a horror film. Sometimes one encounters an Anime that blows away any preconception you had about it. This is one of those Anime! 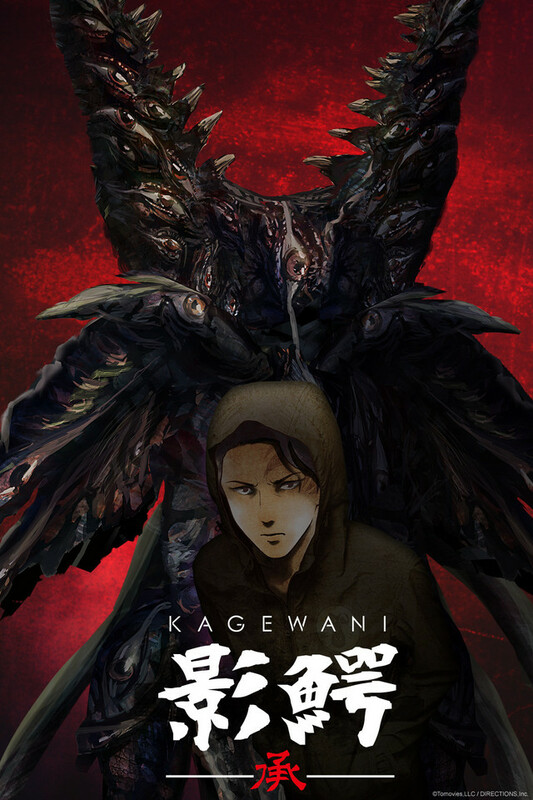 "KAGEWANI" attracted me with it's unique Animation, & kept me there with it's fantastic story telling. You would never think it possible to fill so much fantastic story telling in just a few 8 minute episodes. Of all the Anime I've tried recently, "KAGEWANI" takes the title as the most engaging I've seen so far. I highly recommend it to you! 2: Engaging soundtrack that sets the atmosphere. 1: Only 7 to 8 minutes long. 2: Animation style might deter others from trying it. 3: I honestly can't find a third con. It's just really great, & worth your time! monsters are something we see in movies. so what if they are real and what if those monster stories you hear in local towns are not only real but they are all linked to one monster that has been killing people for a long time. when there are monster there one man who will investigate and sometimes save people who are in danger. he wants to know why they exists and how to stop them. watch this short anime to see if he can find out the truth. If you don't have much time, are an anime fan, and enjoy horror then this is a series for you. -Warning Spoilers Ahead- That being said the series is relatively stronger towards the beginning, as the end has the rather cliche evil corporation focused on weapons testing at the cost of human lives. The big reveal for the monsters is a bit mystical dealing with kodoku, https://en.wikipedia.org/wiki/Kodoku, however by tying the creatures to only those changed by the remnants of the kodoku it offers a logical reason as to why cryptids could exist in low enough numbers as to not need a breeding population. As final point the animation style is bit unique and can take some getting used to, but overall adds to the tone of the series. A creepy monster show with a nice mysterious atmosphere. This is from the creators of Yamishibai: Japanese Ghost Stories, so it has a similar animation style. Movement is kept to a minimum so the show's focus is mainly on what is happening. The protagonist is not really there much, and it seems that we are learning about the stories as he hears them. At least that is my theory, since he is a professor that specializes in these UMA's or cryptids. The monsters are interesting, creepy, and feel like real threats. I'm not sure if they are basing the monsters off of some legends or if they created them from scratch but they really feel new and mysterious. The show does seem to have a core central mystery that will slowly unfold by the end. I would recommend this to anyone who is a fan of creepy or unsettling stories. The first few seconds didn't impress me. As the story progressed, I became intrigued. The quality is actually good for something that seems low budget. The animation is fluid and the background/foreground are how they should be. The stories and monsters are great so far. So far, the anime revolves around these short stories where a detective somehow is close enough to get involved in all these strange cases. He begins to see overlap between the cases, but it's still ambiguous and unknown. An anime I look forward to watching more off. Kind of a shame they're shorts, but that is fine. Like Yamishibai without my hand in front of the screen! I'll admit, I'm a total wuss when it comes to scary stories. So I suffered through the entirely of Yamishibai for two reasons: my husband loved it and I loved the art style. The limited movements, the paper cutout looking figures, etc. were new to me and served to make a regular ghost story show stand out. So when I saw the same people were doing a monster series...sign me up! And largely, it lived up to my expectations. I could actually watch the entire episode, liked the introduction to Bamba-sensei, and look forward to future episodes. Would suggest watching this all the way through or watching a couple Yamishibai episodes if the animation bothers you. I'll admit, it's not for everyone but I do think it pairs will with the stories. Looking forward to where this is going. So glad this is looking to be the series I'd hoped it would be. I this the second episode was even better than the first and it definitely cemented Kagewani on my simulcast list. The Kamishibai Animation style is a bold approach, reminds me of Yamishibai: Japanese Ghost Stories, but it is interesting thus far. 4 stars for now, but lets see how Kagewani's story unravels, in the proceeding weeks. If you enjoy horror, and don't mind the animation style, then this is your anime.